​​ HOUSTON – H-E-B broke ground this weekend on a new 90,000-sf store in the Third Ward. The store will be on nine undeveloped acres at SH 288 and MacGregor Way. The lot sits in an area considered to have low access to quality food, according to the U.S. Department of Agriculture. 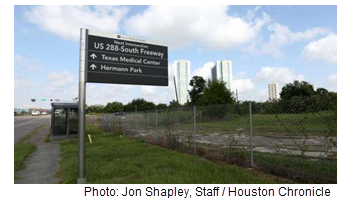 Last year the city spent $13.9 million in economic development funds to purchase the land from the Houston Community College System and is leasing the property to Houston Housing Finance Corp, which is subleasing it to H-E-B.